The water main upgrade continues along Durham Street as per usual, and the highlight of this week was installing temporary car parks down by Eastern High Fi. This was a great idea from Fulton Hogan to be able to make good use of the space temporarily while works are happening further down the road. The south end of the lane has been excavated and the wall has been backfilled. We have also started work at the north end of Durham Lane and have come across some challenges with underground services in this area which need to be addressed. It is intended to remove the existing wall next week and begin the installation of the wall supports. You may experience some extra noise in this area while we remove the concrete bases in this section. 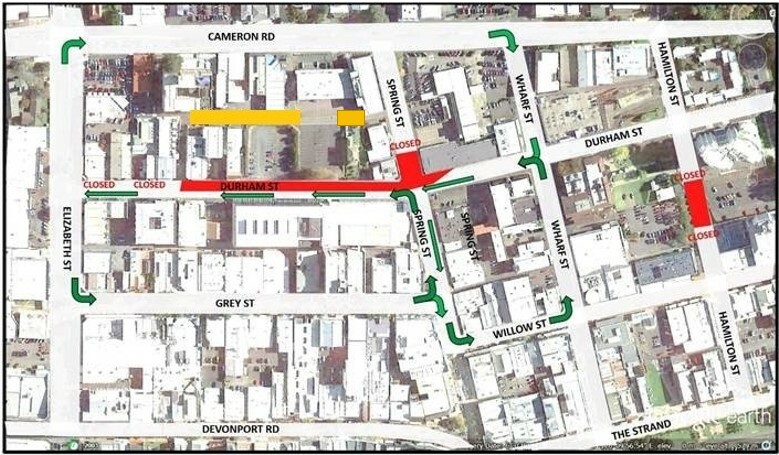 Durham Lane will be closed to through traffic while this work is underway. We are working with people who have parks in this lane to minimise the impact to them. This week we have been working to improve the strength of the ground at the intersection by adding extra aggregate. We had to close the road last night to be able to dig across Durham Street - thanks to all those for accommodating our closure, it all went smoothly and we are back on track. The work to improve the ground strength is now complete and we are moving forward with our programme to install cement-stabilised metal as the base layer for the new concrete road surface. Mid-week we will begin boxing out in preparation for pouring concrete.